The shipping industry is a constantly growing and changing industry. As a consumer of trucking-related software, it becomes more and more important that you adapt to the latest technologies to run the most efficient operation possible. 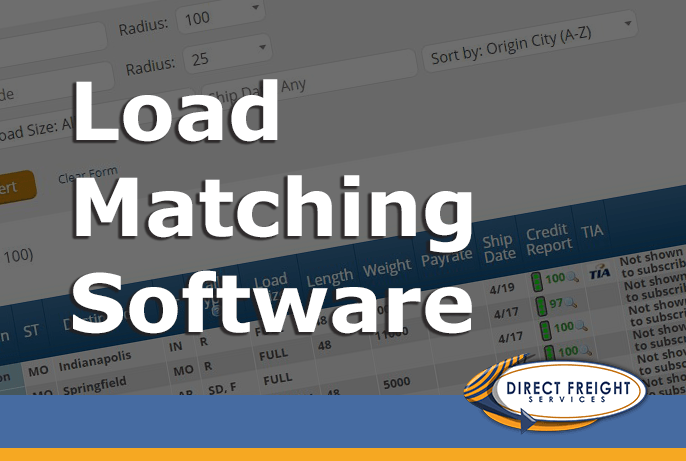 Whether you’re a freight broker or a carrier, you want to provide a vital, superior service to your customers and to do this, you need high-quality load matching software that’s user-friendly, efficient, and won’t break the bank. Having software that is “in the cloud” offers benefits to shippers, vendors, and truckers alike. Because it is managed in one central location, updates and changes can be done without disrupting user access. It can be accessed from anywhere using any mobile device, whether a laptop, iPad, or phone. Cloud-based software allows users to find and post freight from anywhere For truckers and carriers looking for freight, searches will always include the most up-to-date information. The streamlined process of a web-based system saves time and money. Such advantages are not merely for the large companies, however, web-based freight matching software can be accessed using an affordable monthly fee which allows it to be utilized by large companies or individuals, essentially leveling the playing field. The software offered by Direct Freight Services is your solution for finding freight whether your business is big or small. It has all of the services you need without complicated applications that you’ll never use. A small monthly fee grants you access to the simple, streamlined system where you can search for trucks if you have a load to transport or search for loads if you have a truck. Or, if you prefer, list your load or truck and let interested parties search for you. It couldn’t be easier. Its interface is direct and simple so your searches will be quick. Our Direct Freight Software will make your operation more efficient, allowing you to move more freight with fewer people, and with the availability of credit information, you can minimize your risks and make informed decisions about who you’re working with. To find out more about how our direct freight software can improve your bottom line, call (888)894-4198 or go here to sign up for a free 15-day trial offer. Start your search today! The Federal Motor Carrier Safety Administration is asking for public comments on existing regulations that could be updated, modified or removed to help usher in autonomous trucks, or automated driving systems (ADS) as they are referred to in a Federal Register notice published last week. Read more here. President Donald Trump took his boldest step to level the economic playing field with China, ordering sweeping tariffs on Chinese goods in a move that could escalate already tense trade relations between the world’s two biggest economies. Read more here. Anyone following the driver shortage saga for the last three decades might think trucking has been crying wolf. After all, with each economic uptick since at least 1998 has come panic over the lack of drivers. And yet freight virtually always gets delivered, and store shelves are only empty when snow threatens south of the Mason-Dixon Line. Read more here. The White House says Donald Trump will campaign to pass legislation this year to upgrade roads, bridges and other public works, as members of Congress from both parties say it will only happen with a push from the president. Read more here.